The Thrift World: $1 Burrito! My last post supported mom and pop shops, and so with this post I may look like a hypocrite... 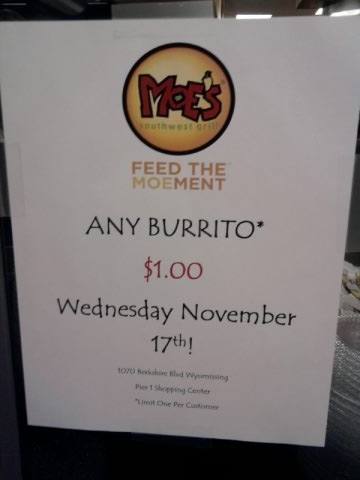 BUT who can turn down a $1 burrito? Specifically a Moe's most expensive burrito: the Homewrecker: normally $6.99, today only $1. Unbeatable. Basically that food chain lost money on me today. No drink, no thank you. Thrift success!